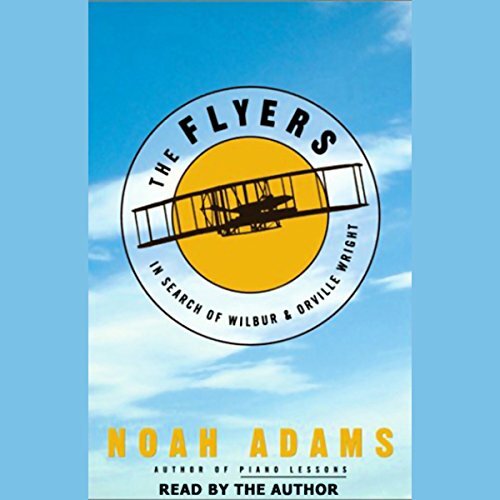 Noah Adams's adventure in search of Wilbur and Orville Wright is a journey that takes him across the country as he follows in the footsteps of the famous brothers in an attempt to know them more deeply, not just as inventors and pilots but as individuals as well. Adams, one of our most distinctive and talented storytellers, traveled thousands of miles and interviewed scores of experts and individuals to piece together his story. He finds a local boat captain to ferry him to Kitty Hawk, along the same route that Wilbur took in 1900, and spends several days talking with descendants of the families who first welcomed the Wright brothers a century ago and helped them conduct their gliding experiments. To experience first-hand the thrill of being in the air, Adams himself goes hang-gliding in the Outer Banks. To understand the aerodynamics of lift and drag and how the famous 1903 plane was constructed, he visits the Virginia pilot and vintage aircraft builder who is creating the world's most accurate reproduction of the 1903 Wright Flyer. He also travels to France to visit the old racetrack at Le Mans where Wilbur startled the European aviation community with his demonstration flights in 1908. In Adams's book we encounter the Wright brothers in a way that no writer has introduced them before. Through the lens of his own experiences as well as original reporting, letters, diaries and other primary source material, he helps us understand the talent and intensity of the brothers and their family, including the fascinating, deeply complex, and at times tragic bond between Orville and Katharine, his younger sister. The Flyers is a wonderfully rich narrative that brings an unprecedented spirit of immediacy to one of history's most dramatic stories.